Although students and families can submit the FAFSA earlier, we still don’t know how that will affect colleges awarding financial aid packages. The hope is that financial aid offices can create financial aid awards earlier since they will have financial data earlier. However, each institution’s financial aid office will determine how they want to maneuver their award timelines. Also note that, because an applicant or family is submitting data from two years prior, there may be concerns about changes in income or taxes since then. Financial aid offices are prepared for this, and families will be able to present information to show that their current financial situation is not accurately represented using the PPY filing. Many colleges also require the CSS Profile, which determines eligibility for financial aid from the institution’s own funds and asks additional questions to assess a family’s ability to pay. Issues like change in financial circumstance can be addressed in the CSS Profile. 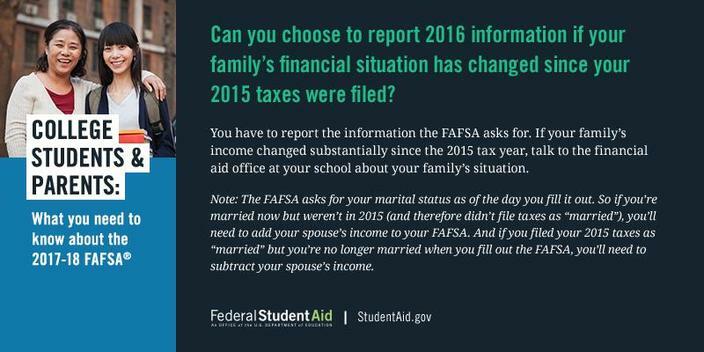 For more info and a video explanation of the changes to this year’s FAFSA process, check out the article below from US News & World Report. Also, visit our new Financial Aid page on the Nav.